Discover National Parks fortnight runs from 6-21 April and encourages everyone to get outside and discover the joy of the UK’s National Parks. An estimated 110,000 million people visit the UK’s National Parks every year, and with 15 parks in total (10 in England, three in Wales and two in Scotland), there is a wonderful variety of landscapes. From wild woodland and ancient forests, to scenic coastlines and majestic lochs, National Parks offer tranquil and invigorating spaces and outstanding natural beauty for much-needed respite from the pace of daily life. Spending time outdoors has been shown to boost our wellbeing and mental health, ensures better work performances, and helps with our self-esteem and mood.¹ And with 74 percent of adults in the UK admitting to feeling overwhelmed or unable to cope due to stress², the benefits of taking a break and getting out into the fresh air cannot be underestimated. Here, Martijn Peeters at Camptoo, the sharing economy platform connecting owners and renters of campervans, shares his top tips on the best places to visit to help Brits plan their next National Park adventure. The Hole of Horcum is the star attraction of the award-winning North York Moors National Park, a huge, natural amphitheatre, 400 feet deep and half a mile across. Locals tell the tale of Wade the Giant, who scooped up a handful of earth and threw it during a row with his giant wife, Bell, thus gouging out the Hole of Horcum. Tread carefully and don’t wake the giants! The Norfolk and Suffolk Broads is the smallest National Park in the UK, but with almost 200km of tendril-like waterways, provide ample opportunity for exploration by boat. Families and groups can hire a day boat or skippered boat, while those wishing to get active can try canoeing, kayaking or stand-up paddleboarding. Sailing is also a traditional pastime on the water and is an exhilarating way to experience the dramatic landscape and raw natural beauty of the Broads. Perfectly timed for the Easter school holidays and just 90 minutes’ drive from London, the South Downs National Park will be hosting wildlife roadshows from 9-18 April, with park rangers talking to visitors about the enchanting woodlands on their doorstep. As the UK’s newest National Park, established in 2010, the South Downs is certainly not lacking in outdoors-appeal, boasting bustling market towns, rolling chalk valleys and graceful rivers. Britain’s only coastal National Park, the Pembrokeshire Coast National Park in Wales has towering landscape cliffs and golden sand beaches to rival the Caribbean’s in the south, and rugged, volcanic landscapes in the north. The best way to experience the incredible scenery is to head out on the Pembrokeshire Coast Path – at 168 miles, it’s not a walk for the faint-hearted, but pull on some sturdy books and bask in the magnificent scenery. Snowdonia National Park is the fourth largest National Park in the UK and welcomes over six million visitors every year. It’s also home to Wales’ oldest nature reserve and 11 historical sites and castles. GreenWood Forest Park is a family adventure park, packed with eco-focused fun, including the BareFoot Trail, and family attractions such as the Green Dragon rollercoaster. 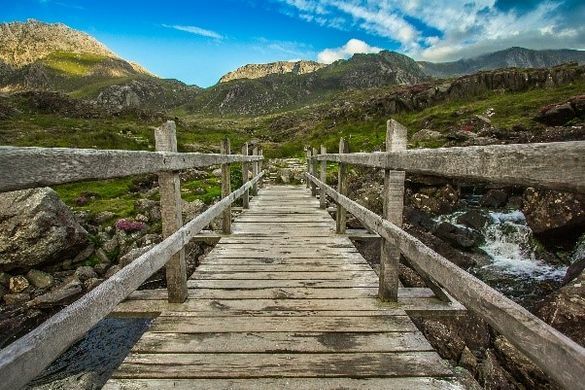 Snowdonia can be explored on foot, by bike or on horseback, and has a varied landscape including mountain peaks, river gorges, valleys and waterfalls, plus 23 miles of coastline dotted with sandy beaches. At 4,528 square kilometres, Cairngorms National Park is bigger than the whole of Luxembourg and is the UK’s largest National Park. This Scottish treasure will be holding Easter activities throughout April, including Easter Egg hunts, treasure trails and wildlife talks. A trip to Cairngorms wouldn’t be complete without visiting a loch; Loch an Eilein is a serene freshwater lake with a walking trail and historical castle ruins on a nearby island, while Loch Garten is surrounded by the tall pine trees of Abernethy Forest, and an RSPB nature reserve. Other Cairngorms highlights include cycling and walking trails, nature reserves, family-friendly museums, and the Royal residence, Balmoral Castle. Inchcailloch, meaning “island of the old woman,” is part of the Loch Lomond & Trossachs National ParkNature Reserve, and is the perfect island retreat in spring. Carpeted in bluebells for picture-perfection, it’s a rich habitat for birds, plants and animals, and a place of tranquillity and peace, as well as outstanding natural beauty. Join in this spring with #DiscoverNationalParks to find the best that the British Isles has to offer. To rent a campervan, motorhome or caravan for a National Park road trip, visit www.camptoo.co.uk. Camptoo founder, Martijn Peeters, is available for interview or comment upon request. Launched in the Netherlands in 2014, Camptoo is a sharing economy platform that connects the owners and renters of campervans, motorhomes and touring caravans. Since it was launched, Camptoo users have booked over 100,000 nights in vehicles rented through the site. Owners are able to generate income from their campervan when it’s not being used while renters have greater flexibility when booking their vehicle so that it best suits their needs.